Among the ongoing tirades about the state of tournament bass fishing, one question has gone unanswered: "Since when does tournament bass fishing – especially televised professional bass fishing – define the beginning, middle and end of our sport?" There was a day in the not-so-distant past when professional tournament anglers were the prime dispensers of bass-fishing knowledge. While not always the creators of new methods, they at least served as the point men in spotlighting useful tactics. In those days, they had the experience and the time to be innovators because innovation often paid dividends at the scales. Times have indeed changed. Although the prime directive is the same – catching the most weight by using the best available technique under a ticking clock – the game is not. In many ways, professional anglers are no longer rewarded for being forward thinkers because the very structure of the contest has been altered. Forget the concept of developing patterns, forget comebacks and forget the learning curve. The authors say the big tube is perfect for wolf-pack fishing because it creates the illusion of tightly-packed pod of baitfish. Photo: Bill Siemantel. The process of cutting the field to a manageable few has turned the pros into read-and-react fishermen. To some this may seem like a subtle distinction. It's not. Making the cut changes things dramatically in how an angler approaches the contest. Especially when the choices made determine sponsorships, television "face time" and mortgage payments. Now, deciding which size of fish is acceptable becomes skewed. This is particularly obvious when weights are zeroed after the cut and the final rounds are golf course, "hole" formats. At this point, the game really does become a game, one that illustrates the most extreme expression of running and gunning. Is it any wonder then that innovation has been lost along the way? Professional anglers are not to blame for they have simply bent to the prevailing wind. To survive, they've become mechanics who cannot veer too far off the standard path of tackle and techniques. It's like a high-end video game that seems to offer unlimited freedom in a virtual world but in reality limits your choices by the very design of the game itself. Consider dropshotting. The quick and nearly universal acceptance of this technique has coincided directly with changes in the tournament game. The strengths of dropshotting dovetail perfectly into this new world. But that's pretty much where the hunt for new techniques has ended. Perhaps the only real hope for resurgence in pro anglers as teachers comes in the expansion of elite events throughout the calendar year. Still, the very design of the tournaments may blunt the effects of a fall or winter bite, especially since pro anglers (those with any kind of life outside of fishing) no longer have a lengthy "downtime" between seasons to refine new methods. It doesn't take much more than a little awareness to recognize that the past few years have shown a severe drop in new ideas, new techniques and new strategies for catching fish. Bass fishing is not just about pro tournaments. Yes, there was a time when the knowledge flowed downhill, when we looked to these guys as field testers of the highest order. They had the advantage of time on the water - an element more valuable than gold to a recreational fisherman. Time and experience were their coins of the realm. With that factor removed from the tournament equation, there is a void that some anglers are just starting to recognize. What really has changed? The answer is pretty simple: Only the game played by elite, professional tournament anglers. For the rest of us, the playing field remains the same. For the average bass fisherman, the goal is to stay on the learning curve. Removed from the formula is the point where the learning curve of professional anglers intersects with our own. Nowadays, if you're looking for answers – or even questions – to angling situations, the pro tournaments are the wrong places to look. Enough talk, here's the meat. Last time around, we talked about dealing with late summer/early fall no-see-ums that create a frustrating bite when bass are on the prowl. As the fall season progresses, an equally frustrating situation develops when bass shift into their "wolf pack" mentality, corralling baitfish in seemingly random explosions here and there. With tubes, you have a bait that can be worked fast, that allows for a stick-and-move gameplan, yet presents the illusion of the very thing bass are keying on. The BBZ philosophy always goes back to finding key, spot-on-spot locations. These are the prime ambush zones for bigger bass regardless of their individual tendencies to move or stay put. Unfortunately, fall foraging forces an angler to reassess spot-on-spot locations in regards to consistency. Make no mistake – if you have carefully evaluated these zones, they will be consistent in producing larger bass, just not as consistently in the fall. The burden of consistency now falls on the fisherman who should be cycling through key spot-on-spot locations, making proper presentations and either nailing home guard fish that haven't moved or intercepting wolf packs on the hunt. How many times have you seen bass erupt in an area, bust baitfish and just as suddenly disappear? This wolf pack tactic of cornering bait may be repeated many times, but it can take anywhere from 5 minutes to an hour or more for the cycle to repeat. Your decision is whether to stay or move and this all comes down to what you know about that zone. How key of a spot-on-spot area is it? Would you be better served to make a methodical milk run of nearby spots and return to it later? This is when the gray area of decision-making comes into play. But no matter how you respond, the difference between finding wolf packs composed of bigger bass as opposed to smaller ones hinges on where you choose to attack them. Larger fish typically use key spot-on-spot locations to do their damage. If you've done your homework, you've already identified those areas. Aside from improving your catch quality, spot-on-spot fishing also helps eliminate fruitless searches, i.e. the typical pursuit of bass as they "migrate" up creek channels. Yes, bass do move into the bays and up creek channels in the fall. And, some larger bass follow this scenario. If the migration takes them to prime ambush areas, your chances of moving up with the fish and finding quality bass should improve. But is this really the case? Be honest with yourself: Do you generally find better and better ambush zones as you move back? In most cases, the cover and structure becomes progressively nominal, thereby weeding out quality fish along the way. It only makes sense. Large bass don't grow large because they frequent sub-par feeding zones. Key spot-on-spot locations attract quality fish for many reasons, not the least of which is feeding efficiency. While you may have to bob and weave more in the fall, the BBZ mindset doesn't waver from the basic spot-on-spot approach and, of course, a strict adherence to top-middle-bottom thinking. For those of you who may have shied away from swimbaits, perhaps the easiest introduction to the big-bait category comes right now with tubebaits. Not only do 6- or 8-inch Lindy Tiger Tubes offer speed of presentation, they also deliver maximum top-middle-bottom versatility. Whether fished sharply subsurface, allowed to pendulum swing through the water column or popped briskly off the bottom, the big-fish potential of tubes far exceeds anything swimbaits can accomplish during the peak fall season. In particular, big tubes tap more directly into that "illusion of realism" concept we've previously discussed here on BassFan. The illusion created is of a tightly packed pod of baitfish. 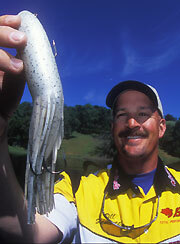 It's also plugging into a very realistic situation – the very same feeding pattern most bass are keying on in the fall. It's not just about creating the illusion, but giving the fish something they expect to see when they expect to see it. With tubes, you have a bait that can be worked fast, that allows for a stick-and-move gameplan, yet presents the illusion of the very thing bass are keying on. Combined with a solid, spot-on-spot mentality, the random nature of fall action can be brought under control. The object is not to follow the fish, but to go directly to the bite.